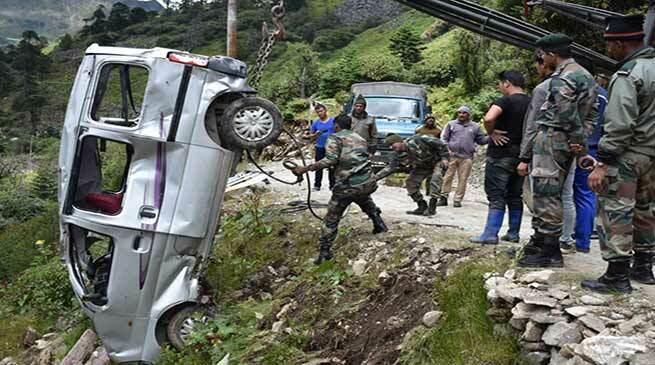 Indian Army rescued eight civilians when a vehicle skidded off the road and fell into a 300 meters deep gorge in Tawang region of Arunachal Pradesh. Indian Army’s East Tawang Brigade under the aegis of Blazing Sword Division rescued eight civilians who were travelling from Holy Water Falls (Damteng) to Tawang. The van they were travelling in skidded 300 meters down a steep valley. The Indian Army Soldiers from a nearby camp rushed to the accident site and extricated the passengers. Their timely act prevented loss of any life and they were provided with immediate medical aid at the Army Camp. These devotees were grateful to the Indian Army soldiers for this timely assistance and saving their lives. Tezpur based Defence PRO Harsh Vardhan said that, their timely act prevented loss of any life. “All the rescued persons were provided with immediate medical aid at the Army Camp,” the Defence PRO said.